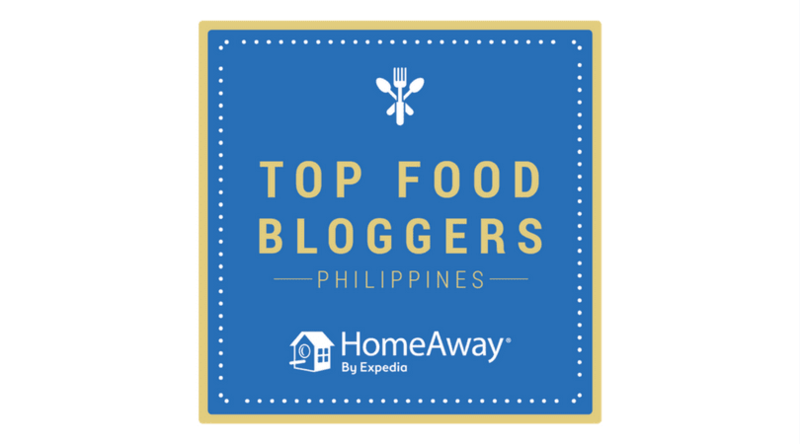 The country’s hospitality industry looks very promising, and with the influx of more hotels and dining establishments, there is no doubt that the Philippines—especially Manila—will be a hotspot in Asia in a few years. But just like the paralysis associated with too many dining options, it can be challenging to find the one that best fits your needs in today’s increasingly crowded hotel scene. 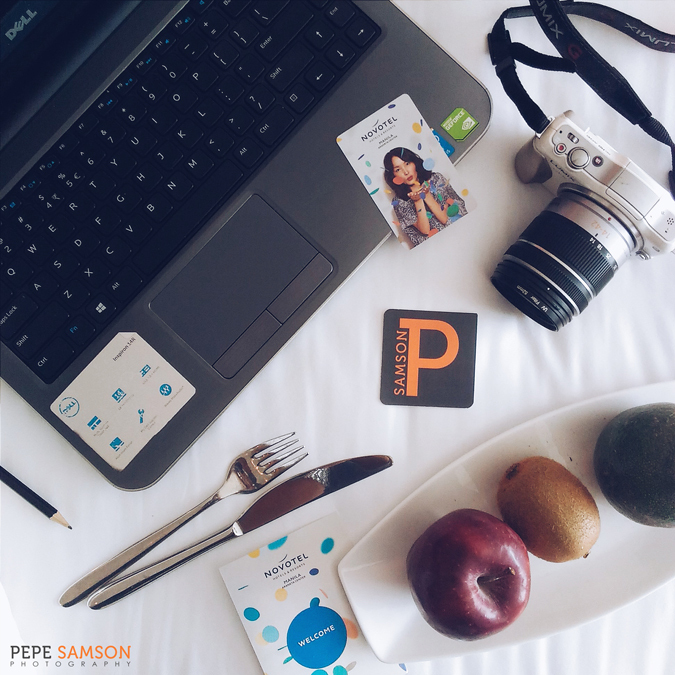 A weekend staycation? A place to stay during a business trip? Or perhaps somewhere you could work and take your family with you as well? 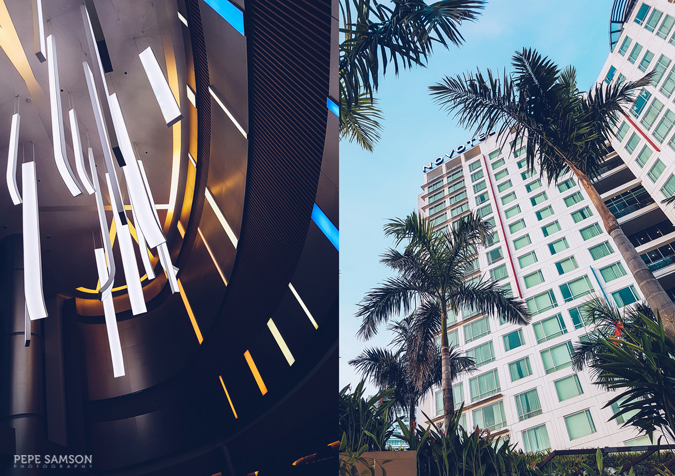 Newly-opened Novotel Manila fuses the best of both worlds seamlessly—a venue for business and pleasure. It might sound premature at this point to declare that it has everything you could possibly need, but just the same, I’m saying it. 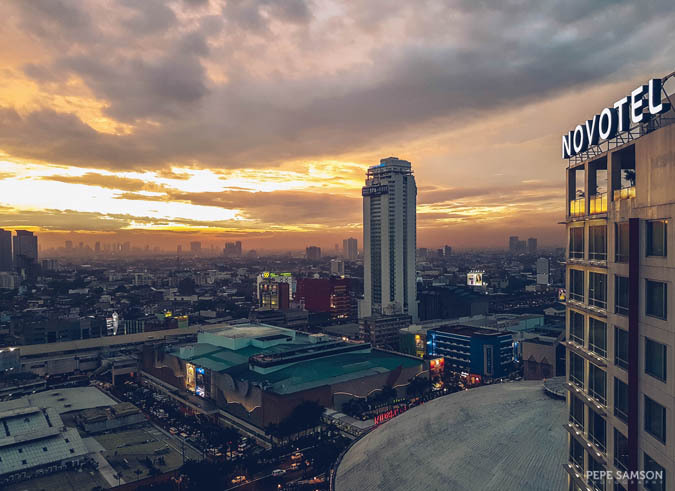 Managed by the same company that operates Sofitel (Accor Hotels), Novotel Manila sits at the heart of Araneta Center in Cubao, Quezon City—a 401-room, 24-storey, 4-star hotel that carries the name of the Paris-based hotel brand. 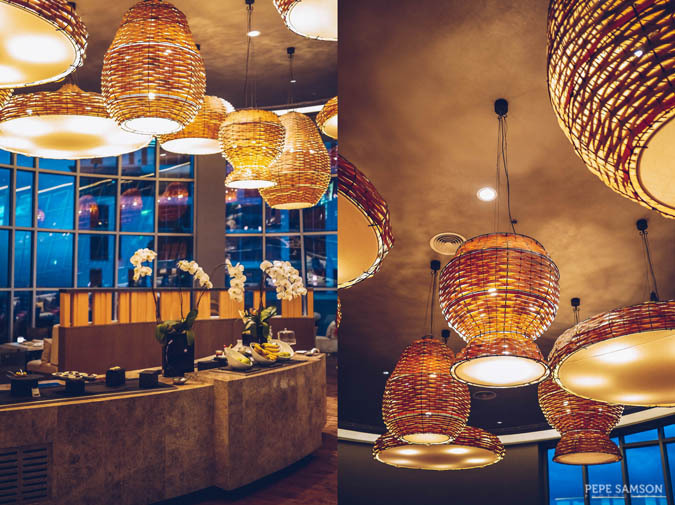 But while other establishments of this stature tend to be all too prim-and-proper, Novotel exudes a much youthful, energetic, and casual vibe without losing the touch of luxury and modernity, making it ideal not only for family staycations but for business trips as well. 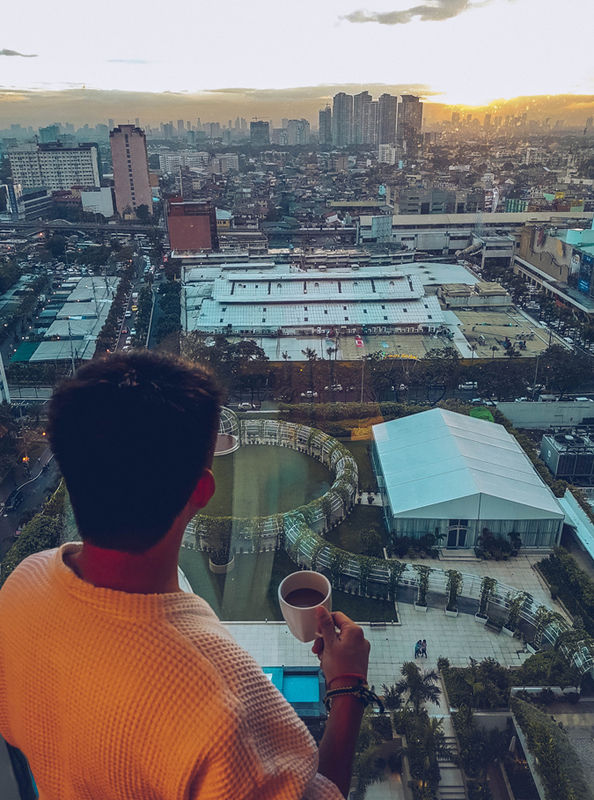 Let me take you to a tour around Novotel Manila, and tell you all the things I loved about it. 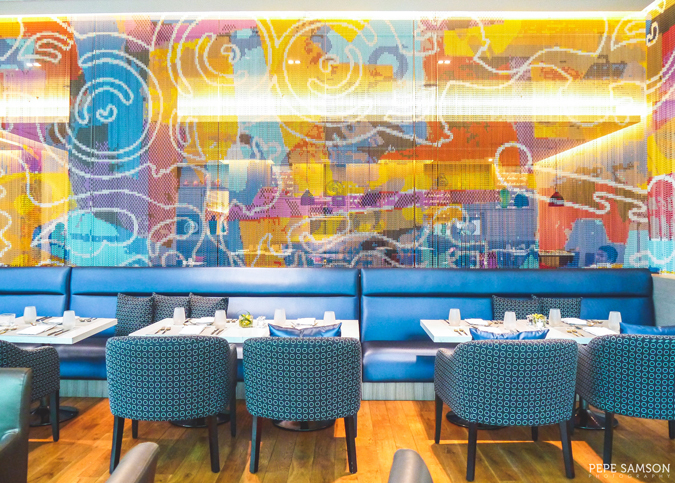 Novotel Manila’s lobby instantly impresses, with a spacious area for the check-in and check-out lanes, an interactive kiddie area, courteous staff, and a high ceiling adorned with LED panels that change colors. It was fun, modern, and child-friendly all at the same time—so far, so good! 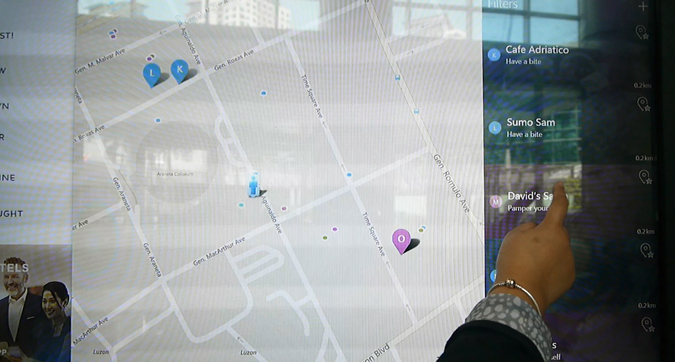 An E-Concierge application is installed beside the check-in counter—a high-tech touchscreen display which contains hotel information, live weather updates, dining and entertainment directories, and incoming flight details. It was pretty impressive since you can look for a nice place to eat nearby with just a few swipes and clicks, and for those hosting and welcoming a business partner, they can track if their guest’s flight is delayed or on-time. An internet station is situated nearby with iMacs, for guests who just need to quickly check something from their email or browse the web without having to bring their own laptops. 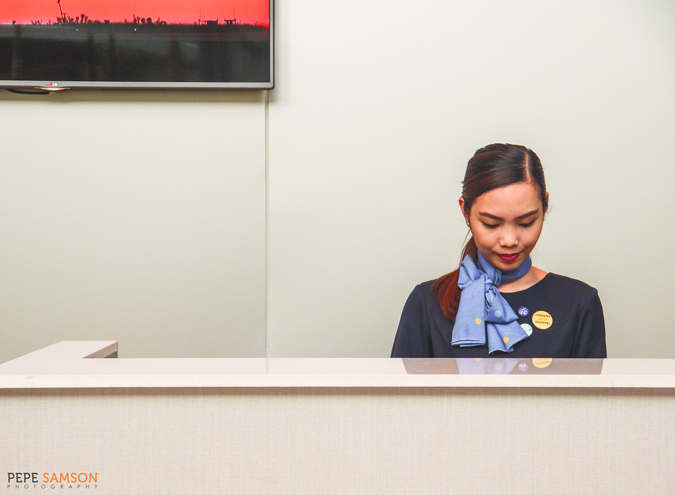 Checking in was generally quick, and if the front desk officer offers you a Le Club Accor membership, go for it. 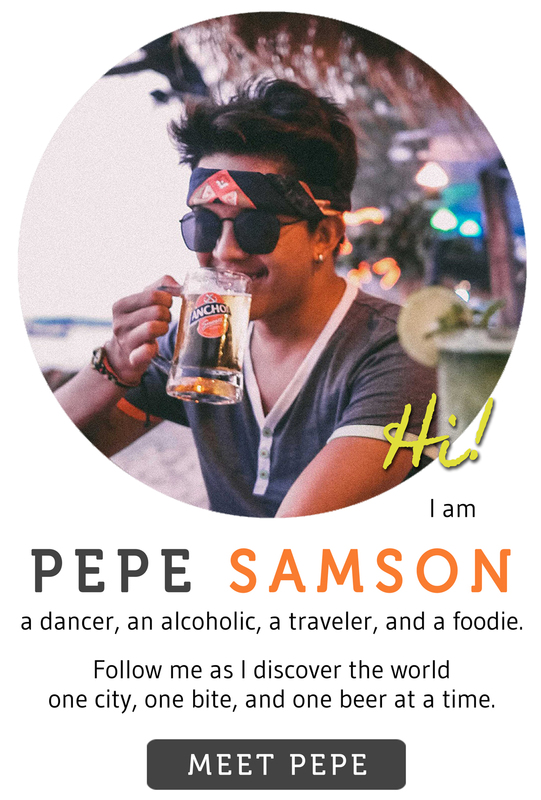 It’s totally free and it will give you access to exclusive promos from all Accor hotels all over the world. You can use it to accumulate points, which you can later use to purchase food from any of their F&B outlets or to book rooms. Plus it will save you time as it gives you access to express check-in. Novotel Manila’s Superior King Room (starts at PhP3,920/night) is well-appointed in a tasteful, playful way and features a King-size bed, a work area, an LED flat screen TV, a window-side lounge, coffee- and tea-making facilities, a safe box, complimentary wireless and broadband connections, and an en suite bathroom. 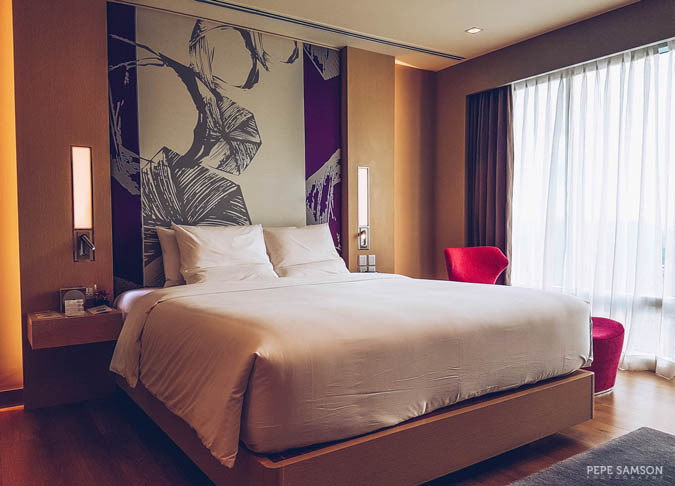 The bed, especially designed for all Accor properties, is called Live N Dream—a spacious bed with a pocket spring mattress, memory foam topper, a fresh, fluffy duvet filled with silicon fibers made of recycled bottles, and two types of pillows. It was very comfortable—whether you just want to lazily lounge about while watching TV, or recline and do some work with a cup of coffee within reach. Indeed, I had a restful, uninterrupted sleep. Both sides have tables, power outlets, and flexible overhead reading lights instead of the usual clunky lamps. The work station comes with an assortment of power outlets which eliminates the need for adapters, especially for international visitors. 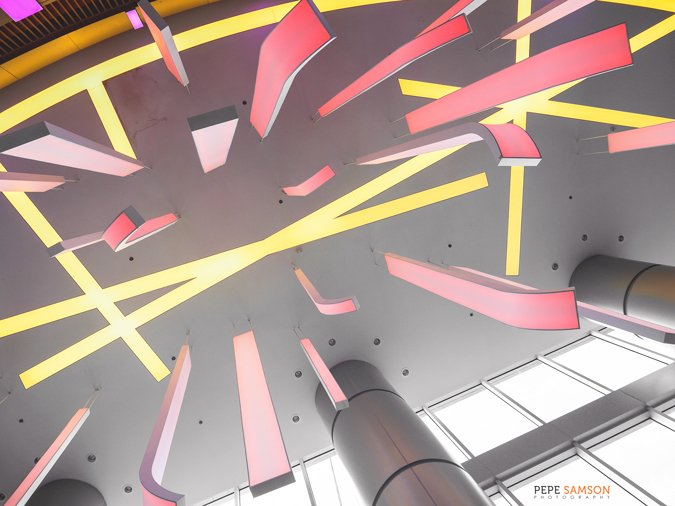 Internet is fast and stable, and reception is strong even in upper floors—making it ideal for business travelers, especially long-staying ones. 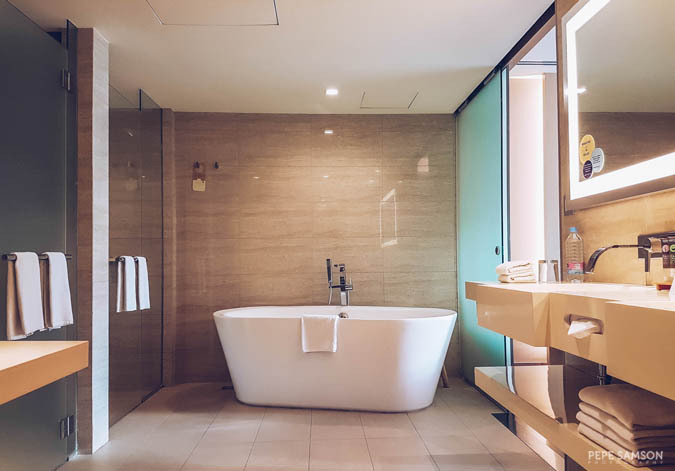 A glass wall separates the bedroom from the bathroom, which comes equipped with a shower area with both rain and handheld types, a separate toilet area with bidet, and a vanity area whose main feature is the heated mirror that doesn’t get fogged up after showers. 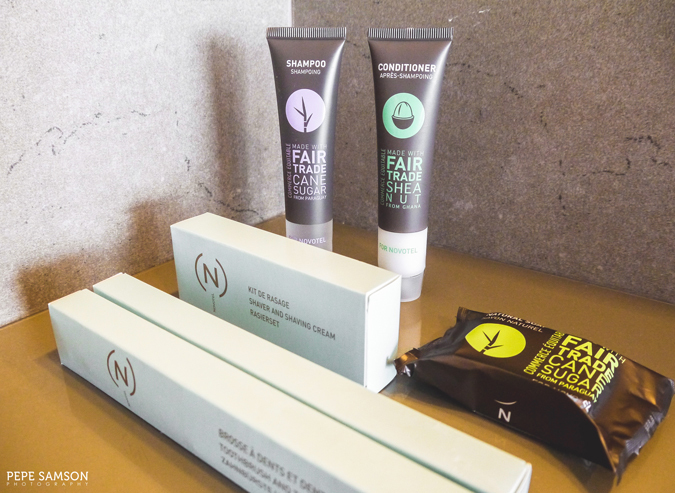 Novotel uses a lineup of eco-friendly bath products made in Paraguay. 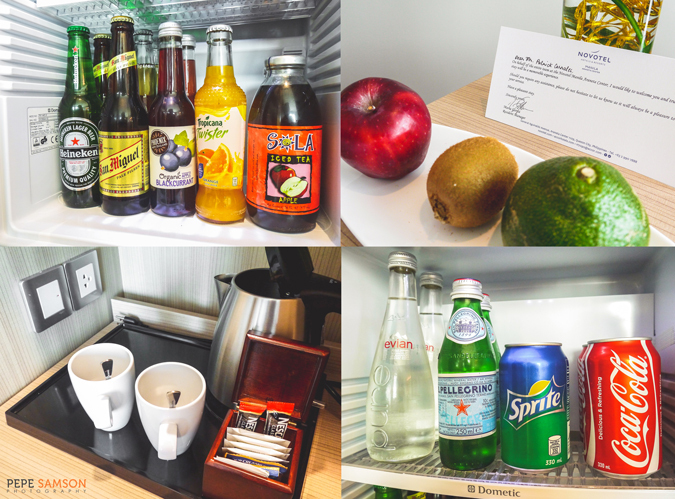 The mini-bar offers complimentary coffee and tea, as well as a selection of imported and local drinks, including Corona beer, Evian, and San Pellegrino (for an extra fee). 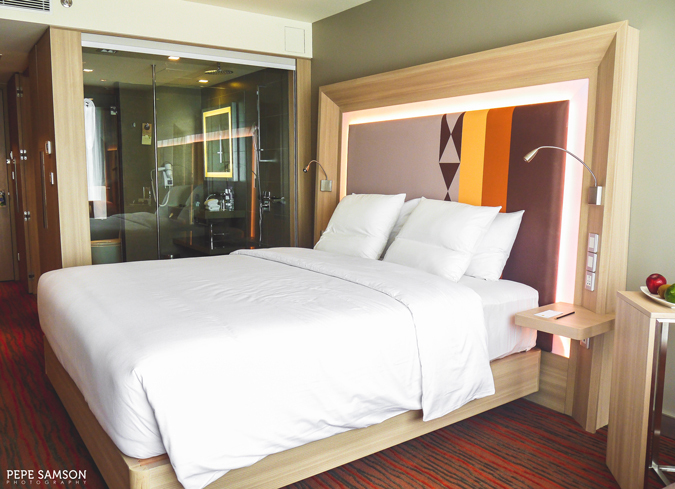 Being a family-friendly hotel, Novotel Manila allows up to 4 persons in its Superior Rooms—2 adults and 2 kids. Children 15 years of age and below get to stay for free and avail of the complimentary breakfast as well. Young folks from 16 to 21 years old get discounted rates. 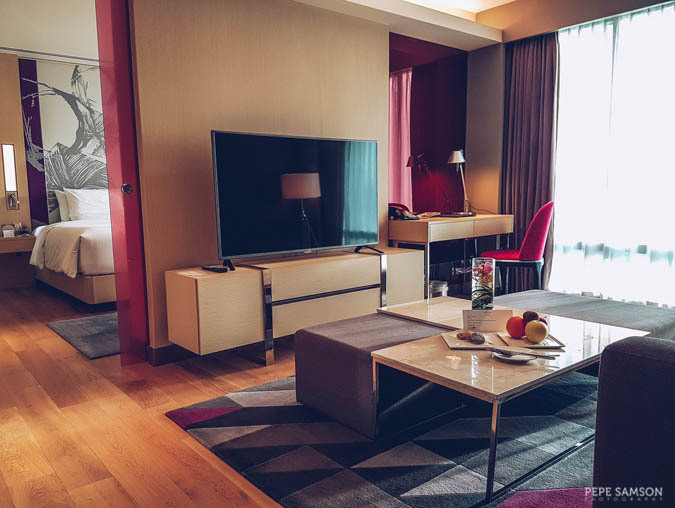 If you seek a little more space and a little more luxury, stay at an Executive Suite—also known as the "Pia Wurtzbach" Suite because this was where she stayed during her homecoming celebration. 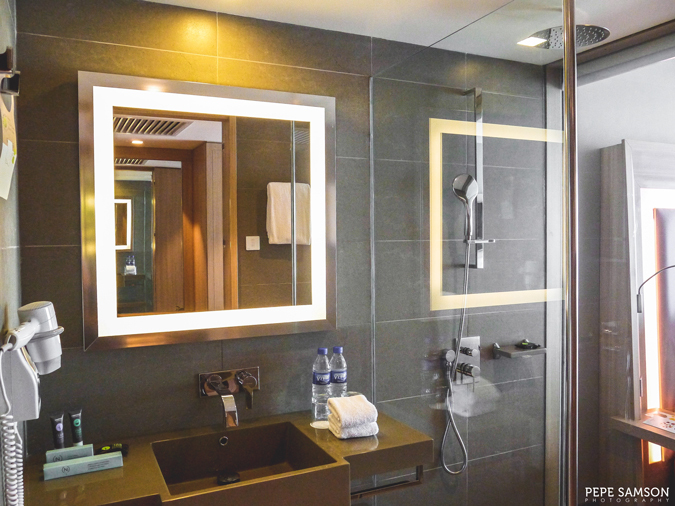 The suite features a separate bedroom, a lounge area, and a luxurious bathroom fitted with a freestanding tub, walk-in shower, separate toilet cubicle, and vanity space for two. 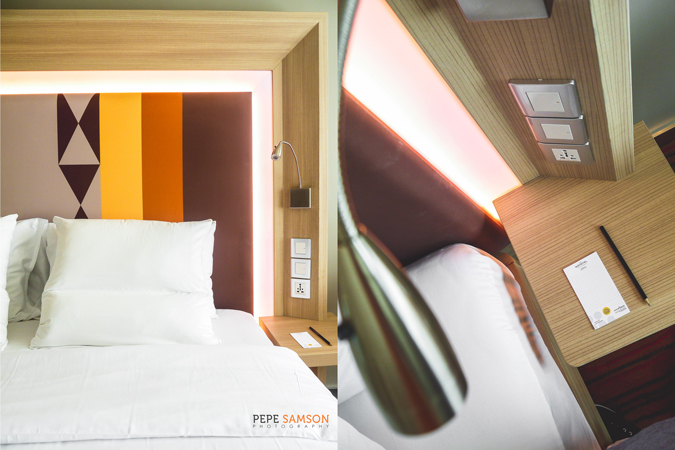 Staying at this room category also entails access to the hotel's exclusive Premier Lounge located at the 24th level. 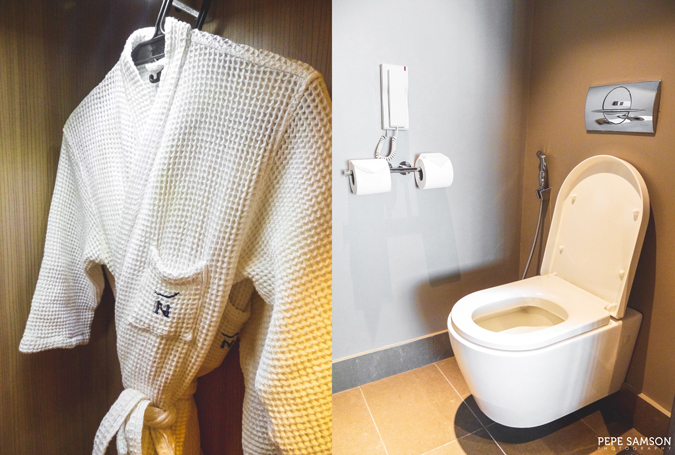 For more details on the Executive Suite, check out my Suite Spotlight post about it (click here). Escape the city. CHECK RATES NOW. 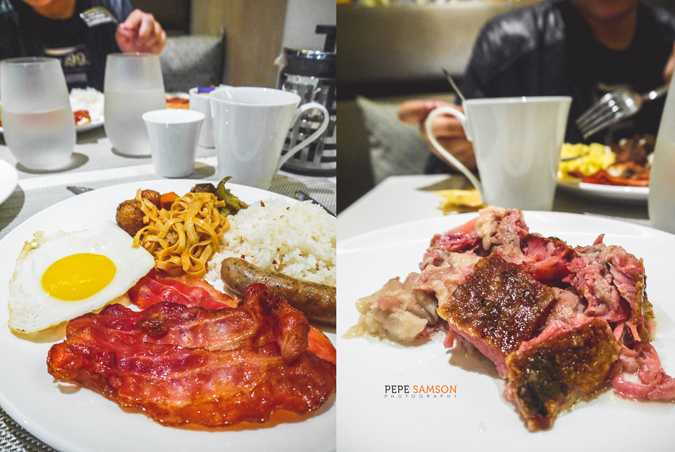 As a late riser, I don’t usually get to enjoy breakfast the way others do—you know, sleepy eyes, the gentle morning warmth and all—but during our stay at Novotel, I retired to our comfy bed earlier than usual and was able to beat the others to the buffet spread. Yep, I was that excited. 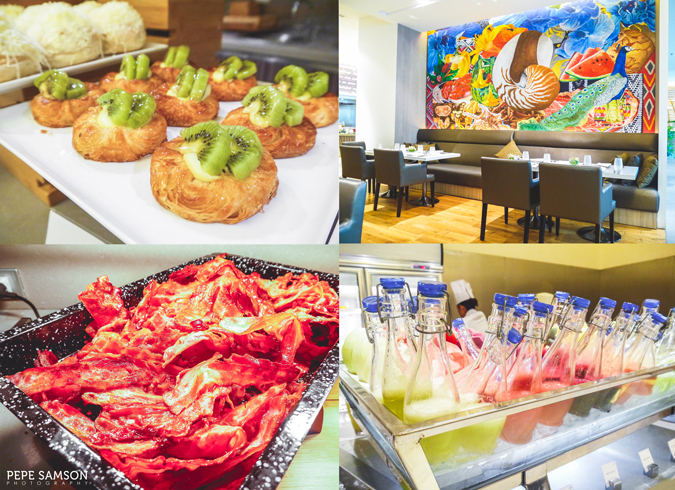 Novotel’s complimentary breakfast is served at Food Exchange, the hotel’s buffet outlet located at the lobby level. 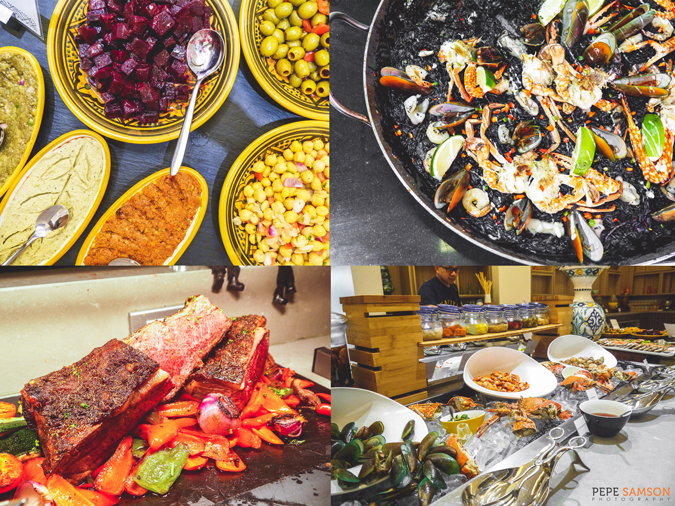 The restaurant replicates a food market and encourages interaction with diners among its many stations. I especially loved the danishes (mango, kiwi), stir-fried noodles, sausages, croissants, and the fact that freshly brewed coffee is served in French presses. 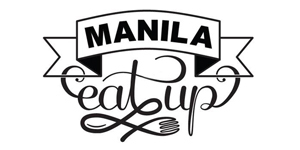 The homemade corned beef, which is brined overnight before getting slow-cooked, is a must-try. 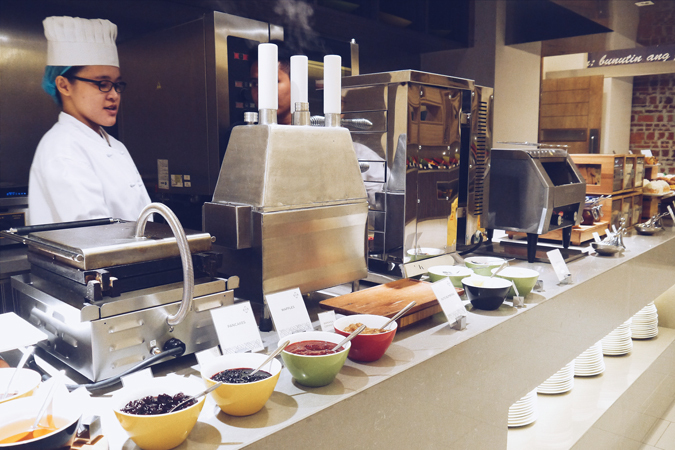 I’ve tried the dinner buffet at Food Exchange months back and what I loved the most was their Indian Station. The executive chef, Chef Rajan, hails from Chennai and whips up legit Indian food—which took me back to Kerala instantly. I also like the small selection of Arab/Mediterranean food, especially the refreshing salads! The dessert station has pretty good selections too including the opera cakes, cookies, muffins, and pastries. The bread station has a number of variants too, including an array of spreads and jams. 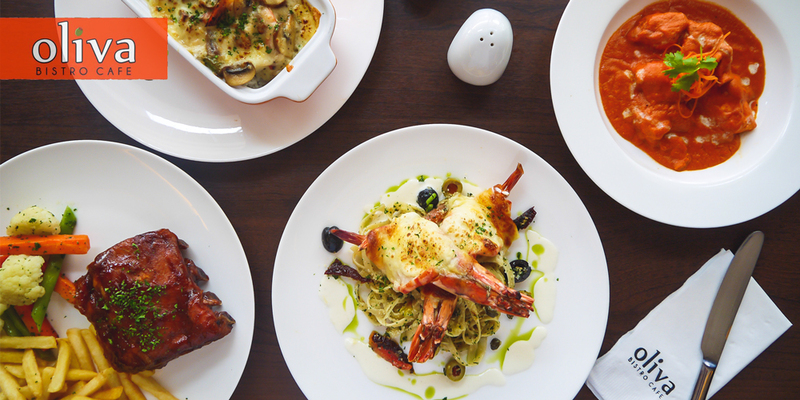 Pancakes and waffles are ever-present, and if you still crave for the flavors of Christmas, Food Exchange serves puto bumbong. Aside from their extensive and delicious selections, what I love about Food Exchange is the fact that buffet rates are pretty affordable. 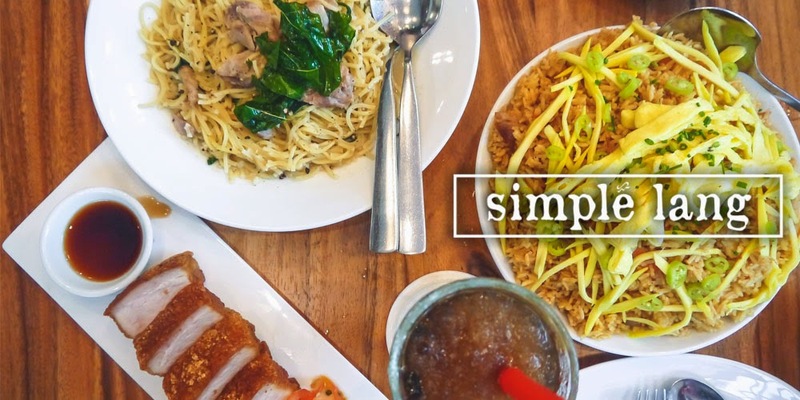 Breakfast for extra guests or walk-ins costs PhP888, while lunch and dinner buffet prices are at PhP1,288 and PhP1,388 respectively. This is real value for money considering the choices you will find here. 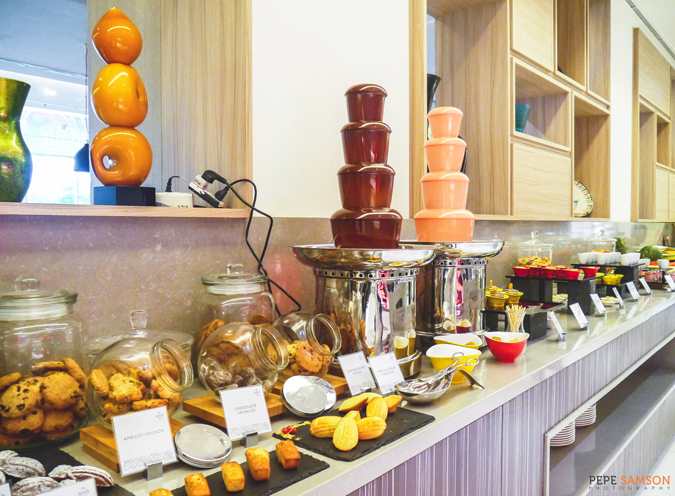 On Sundays, a special spread is set up for brunch at PhP1,588 per head. 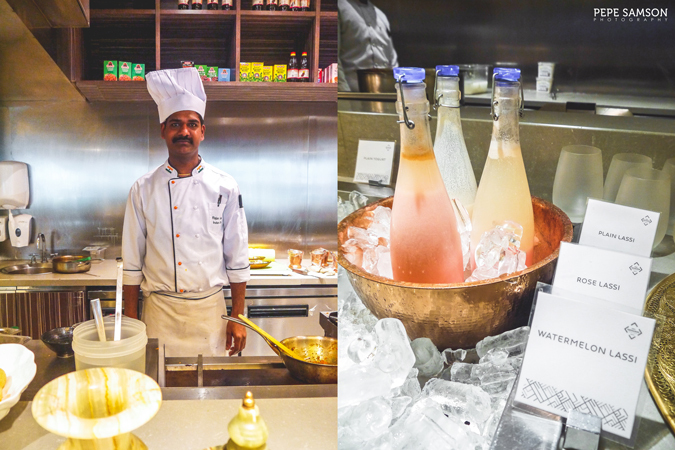 There are more items in the carving station to choose from, as well as free-flow sparkling wine and Bacardi-based cocktails. Families will definitely enjoy the Sunday Brunch offering—there’s even a Kids’ Area set up every Sunday complete with toys, clowns, and magicians to entertain the kids. 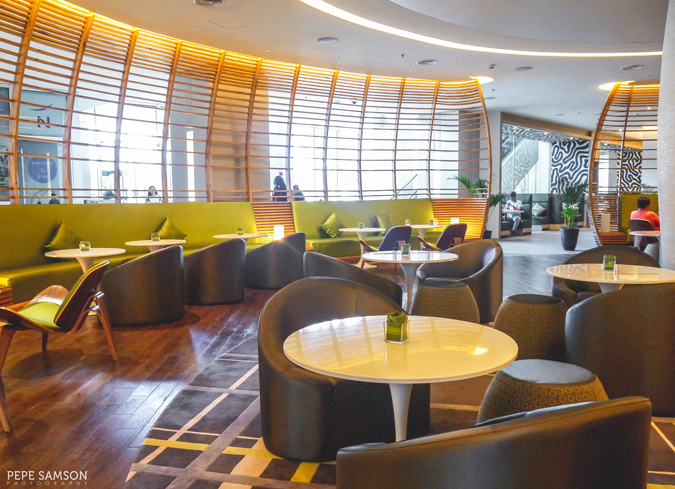 Gourmet Bar, Novotel’s lobby lounge, offers a la carte Western cuisine all day along with a lineup of cocktails, beers on tap, liquors, wines, and coffee concoctions. The cozy space is beautifully decorated with earthy tones of browns and greens, accentuated by wooden pieces and rounded shapes. 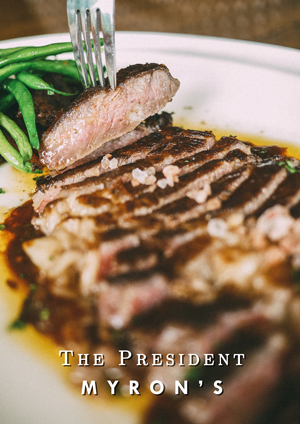 Open from 12:00PM until 12:00AM, the bar is perfect for lunch meetings, evening drinks, or casual meetups. 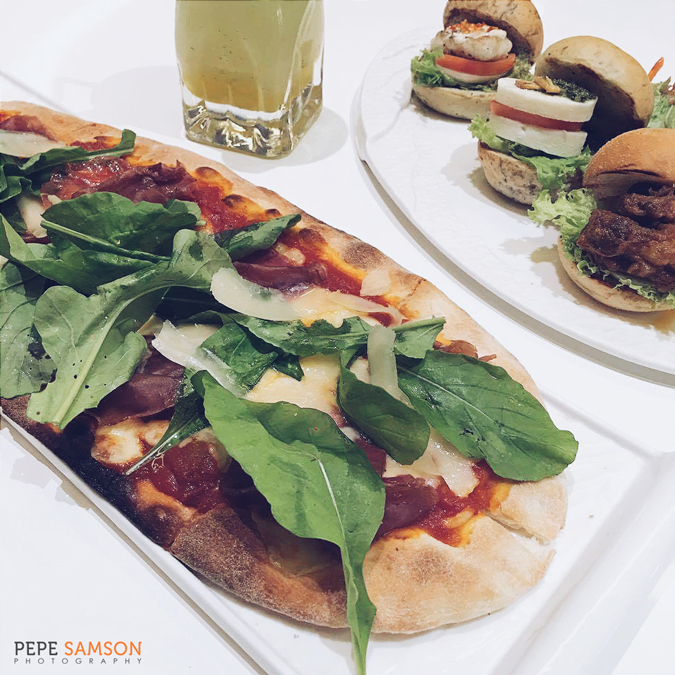 Must-tries include the trio of sliders (loved the Beef Caldereta and Tomato & Mozzarella Sliders), Black Linguini with Talangka Paste, pizza with air-dried beef and rocket leaves, panna cotta, and the signature Unleaded Cucumber. Their Watermelon Mojito is exquisite. I loved how the bartender, Curt, encourages interaction—explaining the drinks to us and asking us about our preferences to come up with a customized drink. 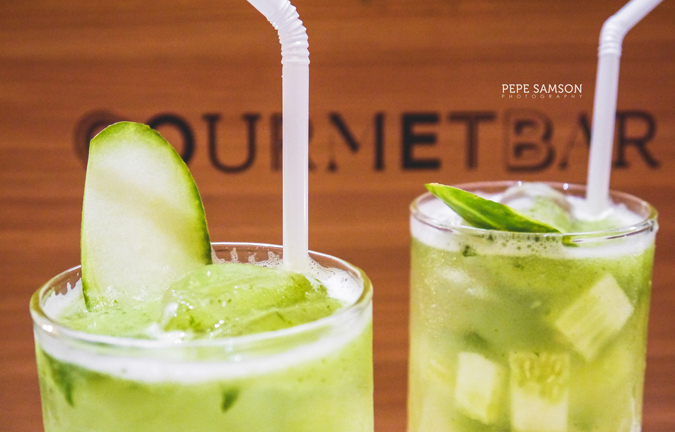 His version of the Watermelon Mojito is the best I’ve ever had yet—a perfect balance of alcohol content, acidity, and sweetness. Another amazing dining option is the Pool Bar & Lounge, which offers barbecue alongside select libations. 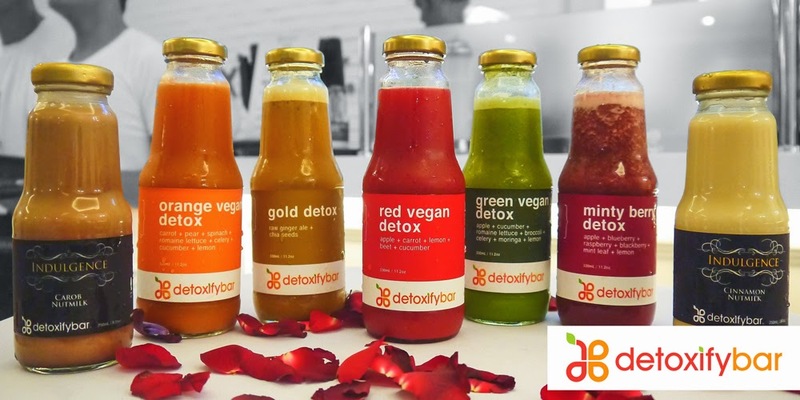 Relax under the afternoon sun while sipping on a cold fruit shake or juice, or witness the place transform into a chic party spot in the evening. Members of the LGBT community will find delight in Freedom Fridays, while those who seek a resort vibe amidst the city can check out the Summer at the 6th every Saturday—both nights feature resident DJs. Accessible only by guests with Executive Privileges (Executive Suites, Executive Deluxe/Superior Room), this intimate lounge at the 24th floor offers all-day snacks, afternoon tea, and pre-dinner cocktails. 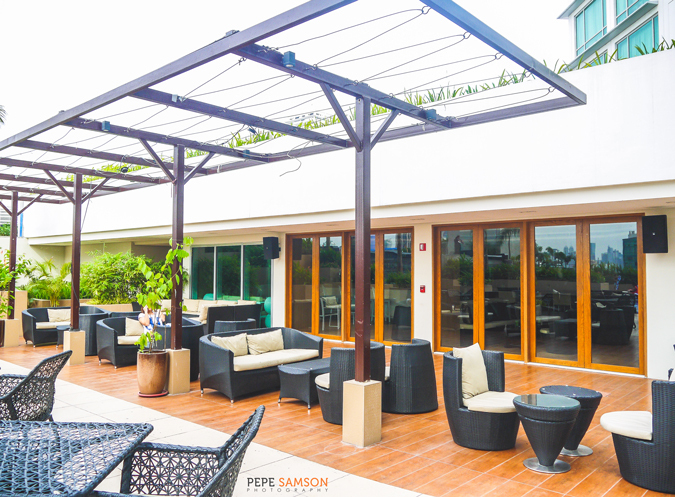 The interiors are modern and very stylish, with the floor-to-ceiling windows offering an almost 180-degree view of the Quezon City skyline. Walk over to the al fresco area and get a bird's eye view of the swimming pool and the bridal garden—or better yet, catch the stunning sunset. 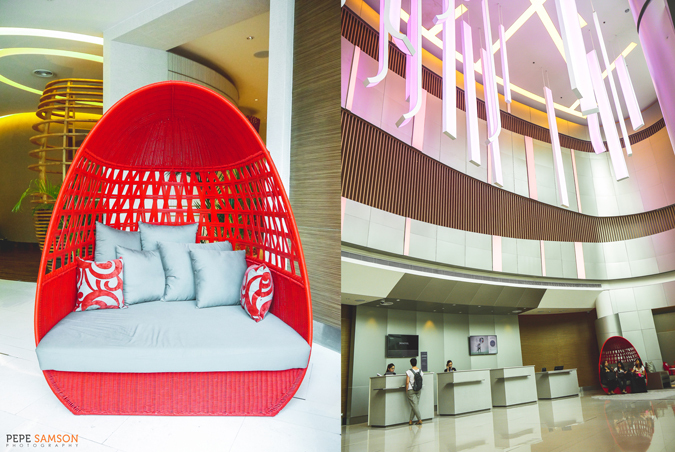 With its strategic location, Novotel Manila has positioned itself into being a MICE frontrunner. 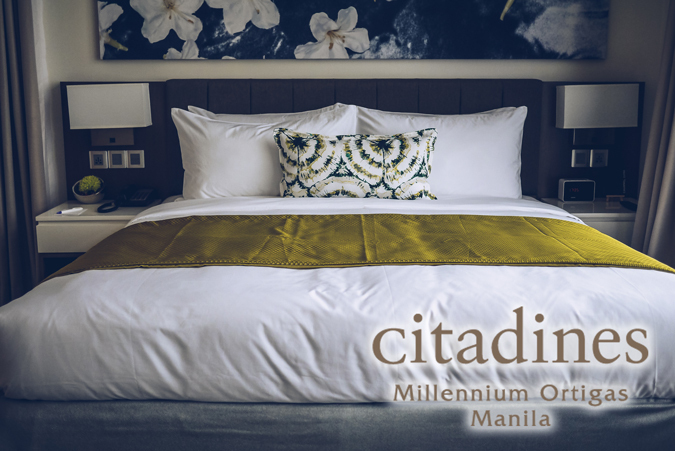 Nestled within one of the primary commercial hubs of Quezon City, beside dining establishments and transport centers, the hotel seeks to provide business travelers with venues for major events, meetings and conferences. The Grand Ballroom can accommodate 1,000 people in a sit-down setup or 1,200 for a cocktail setup. The space has partitions and can be divided into 3 smaller function areas. 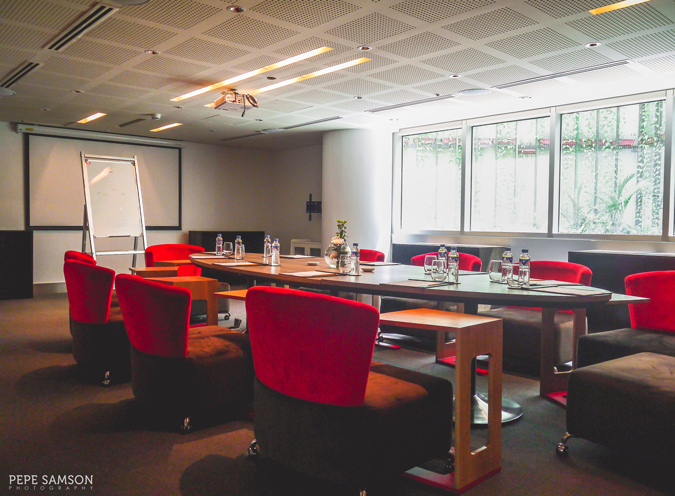 Smaller meeting and function rooms are distributed throughout the third level, each one designed differently and catering to different requirements. 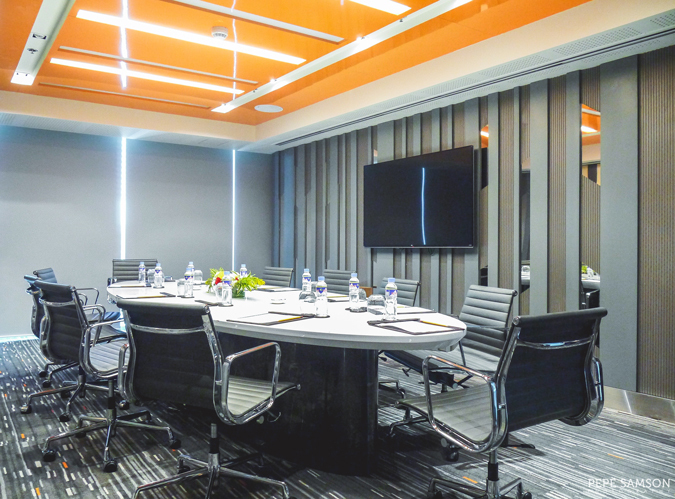 There are vibrant, casual spaces designed for brainstorming and inspiration—like the Eureka Room (picture below), which features tables that can be split to accommodate both group discussions and one-on-one chats—while others feature more formal arrangements for round-table discussions. All rooms have the basic equipment like podiums, projectors, video kits, etc. Fitness and leisure dominate the sixth level—here is where the gym and the pool are located. 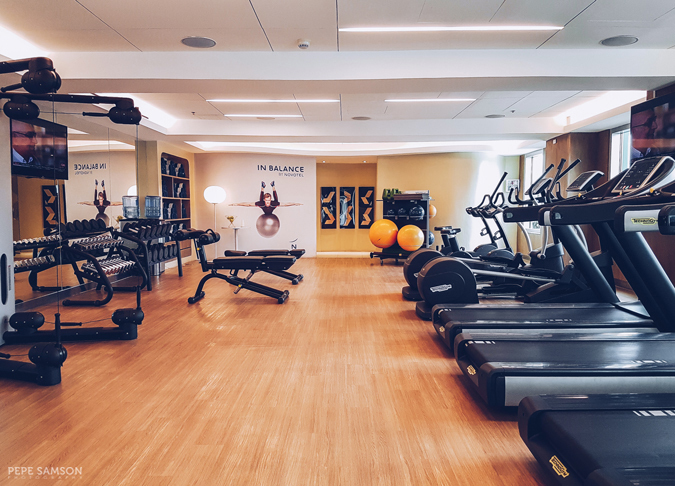 The In-Balance Fitness Center has all the basic equipment (including a sauna) and is free for use for checked-in guests. The pool area, on the other hand, has two unheated swimming pools (adult, kiddie), a play area, and an elevated DJ’s booth for events at the pool bar. 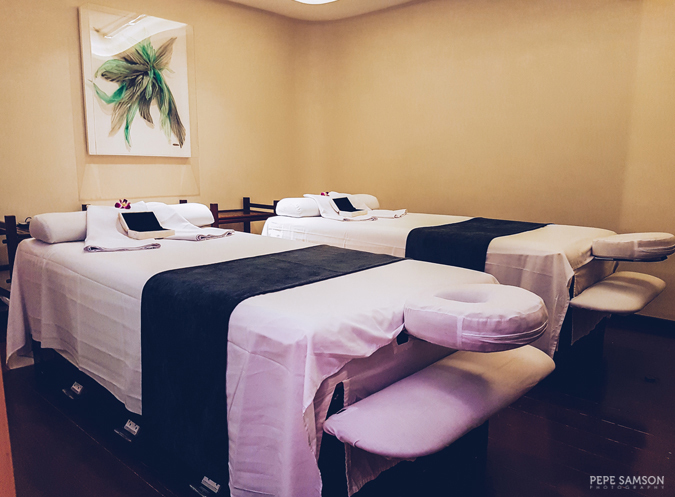 The In Balance Spa, one of the newest additions to the hotel's facilities, offers reasonably-priced treatments to guests who are looking to pamper themselves. 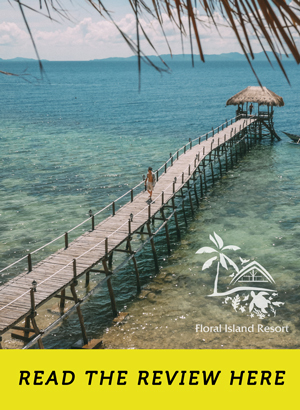 Massage treatments like Swedish, Shiatsu, Hilot (traditional Filipino massage), Aromatherapy, and Thai coupled with Hawaiian Lomi Lomi (their signature massage) are available. Foot treatments, facials, and scrubs are offered as well. 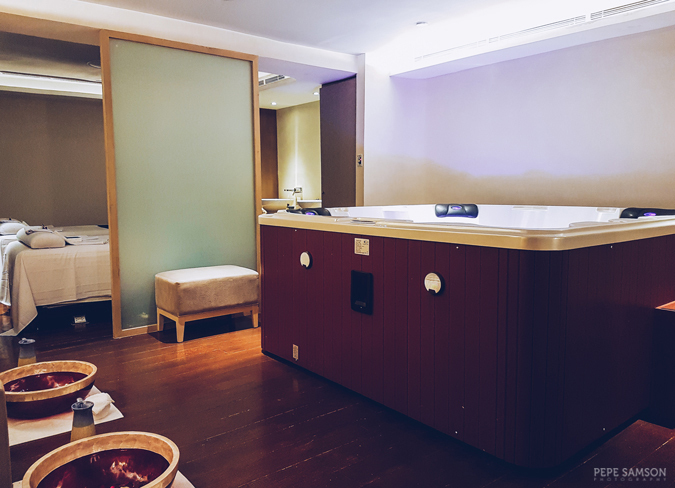 Luxuriate in the spa's gigantic Jacuzzi afterwards. 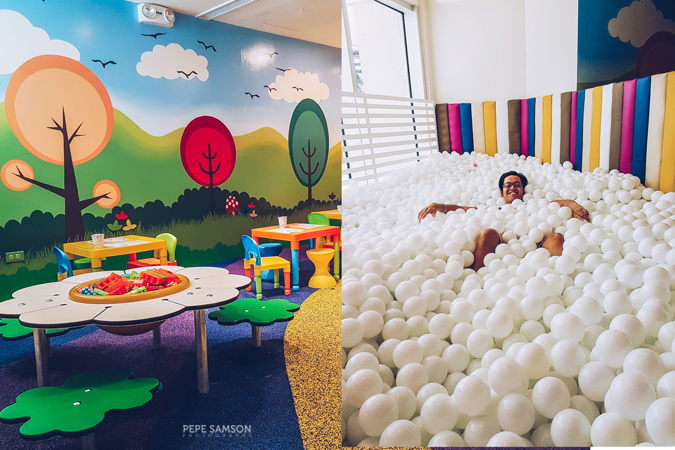 Those staying with kids can take their youngsters to the Kid's Zone located just across the Fitness Center, a spacious facility where they can enjoy playing with toys or have fun in the ball pit. The Bridal Garden sits nearby with its exclusive 2,500 sqm space, combining sweeping views, beautiful arched entourage entryways, and an air-conditioned banquet for the wedding reception. 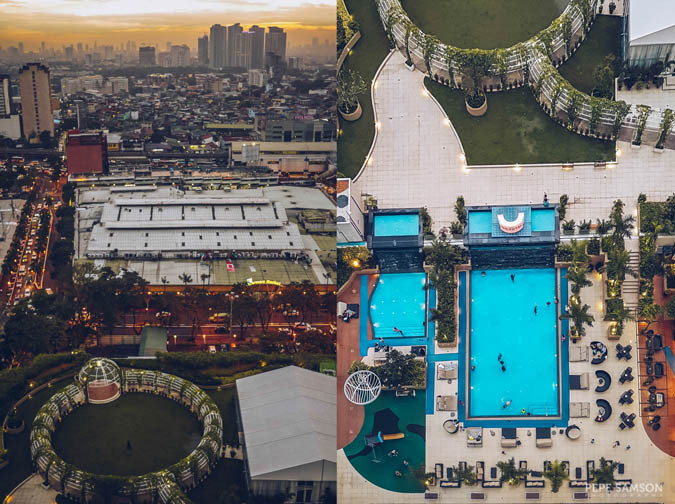 You might wonder why a hotel with such ambitions dared to open in Cubao and not in Ortigas, Makati or BGC, but when you really think about it, Novotel is not only paving the way for more businesses in the future but it is also opening new possibilities of transforming this side of Quezon City into a major commercial hub. Daunting as it may seem, its location inspires new markets, opens new gateways, and secures a solid spot in what could possibly be “the next big thing”. In other words, Novotel has thrown itself into the limelight—at the forefront of the hotel scene in a sea where nobody has dared to wade. Coupled with the abovementioned things, Novotel puts in an extra touch that Filipinos just can’t say no to: being a family-friendly hotel. 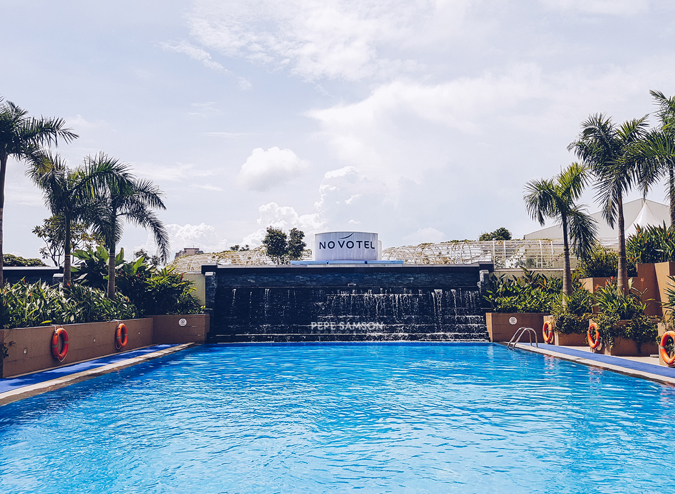 Especially now that more and more people have begun to explore the joys of staycations, Novotel will provide high-quality stays at more affordable costs, and with its versatile dining options and balanced menus, I don’t know what could possibly be better. 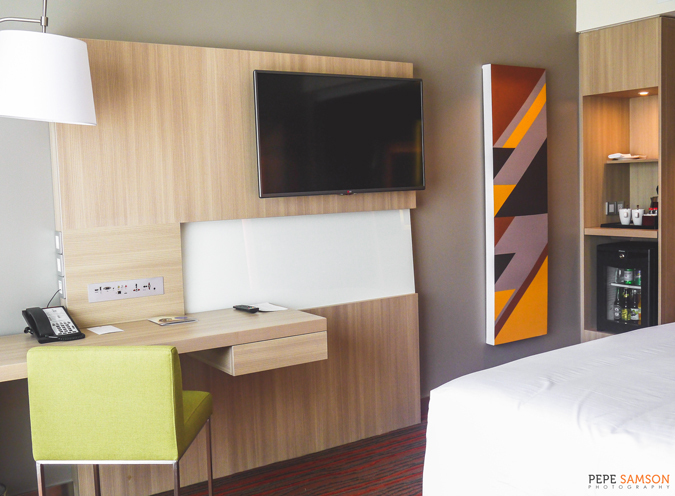 The rooms are new and smartly designed. The bed was superb. Staff members, specially in the restaurants, are very friendly and efficient. Food Exchange offers great and varied options; Sunday Brunch is an awesome deal; Gourmet Bar is the perfect hangout or meeting spot. The hotel still has a touch of luxury while being casual. Near malls, restaurants, and transportation centers. Possibly the best hotel choice in Quezon City. 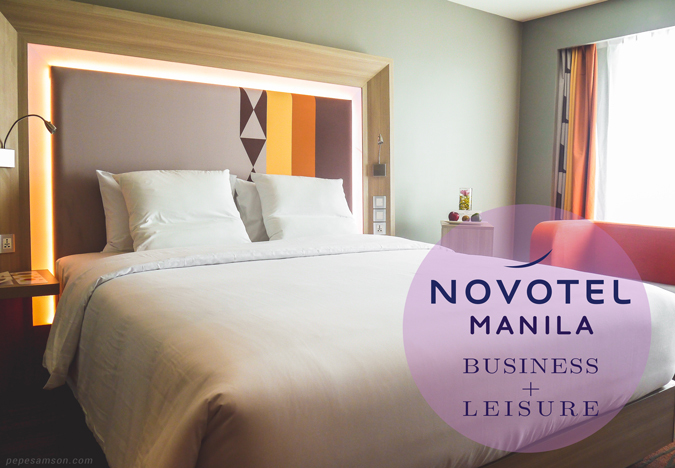 Have you stayed at Novotel Manila? How was your experience? 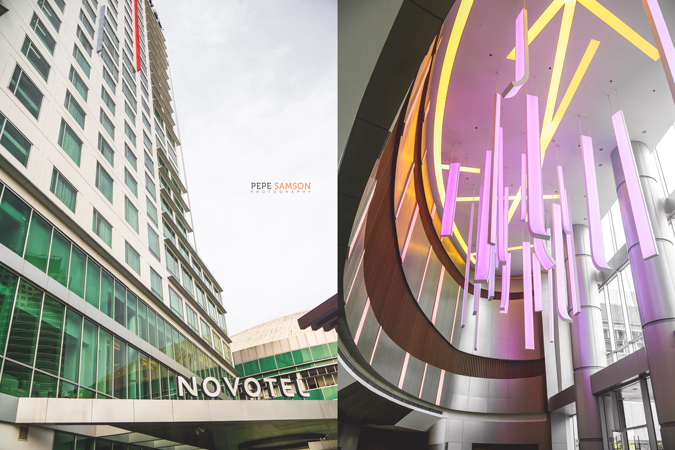 My stay was sponsored by Novotel Manila Araneta Center. All opinions, however, are my own.